33 is my ideal tire size and since I'll be moving to alaska I could use a bigger tire yet I don't want to go wider. I've heard 33x10.50s offer the best all around performance without having to change too many components. My questions are; 1. Does this fit stock without rubbing (If yes, provide a link to pics or info concerning this) 2. If it requires a little modifications will I need to adjust my Torsion Bars up? I don't want to go over an inch lift in the front, not just yet. Why not wider? A wider foot print in the snow is ideal. 32x11.5 would fit with a slight crank. I have seen people put 33s on stock with a lot of crank on the t-bars, but they usually run a 12.5 wide, not sure about the 10.5. Why not wider? A wider foot print in the snow is ideal. That is a common misconseption. Narrower A/T tires are actually better for on road and light wheeling, as long as you don't encounter much mud. It is the snow itself that actually gives you better grip and it sticks inside your lug patterns and sticks to itself as you keep your wheel speed up. Plus, I feel the 10.50s are fine enough for me being that I try not to submerge my truck in mud or muddy roads often enough to grant me the need. The 31x10.50s I have now are great, I would just prefer more height. 33x10.50s are common on stock trucks, a torsion bar crank will be required, and if you plan to offroad it at all you can expect rubbing on the flares. Even on a Level II FX4 with 31x10.50 stock? How much cranking on the bars? Rear flare may be contacted by the tire during axle wrap / wheel hop. Traction bars cure this. 33x10.50s on aftermarket wheels with zero or negative offset will likely contact the plastic inner fender, fender flares and/or bumper valance. Depending on the wheel offset, 33x12.50s WILL contact some combination of the following: sway bar, inner fender, bumper valance, fender flares. Last edited by rwenzing; 06-05-2009 at 05:13 AM. Master Rwenzing to the rescue! Good to see you aboard! Awesome, thank you for your very informative response. 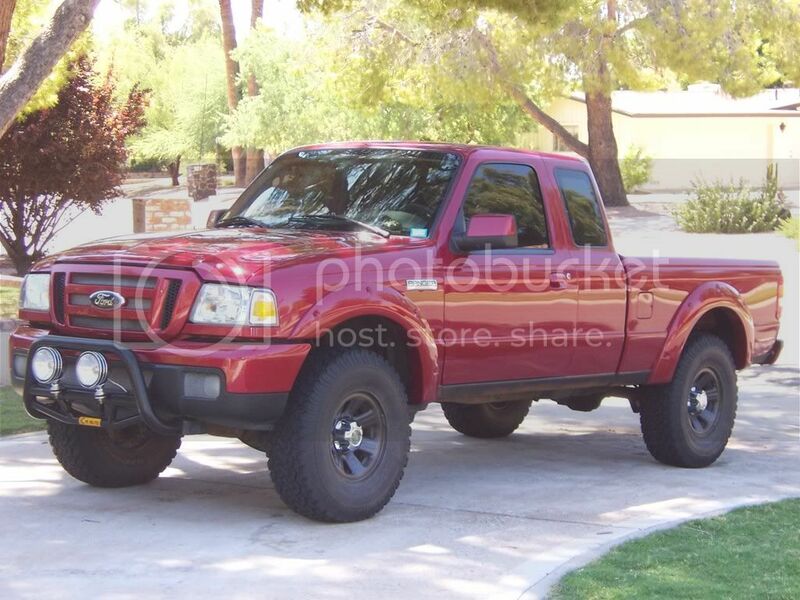 I'll be looking into replacing my 31x10.50s with the 33x10.50 BFG A/Ts. What traction bars would you recommend? I currently have no problems with axle wrap or excessive wheel hop. Should I also look into replacing my gears? I have 4.10s now and I don't want to lose my Torsen Differential. Personally, I couldn't justify the cost of regearing both diffs when only going from 31's to 33's with a 4.0L. You'll probably notice a little milder acceleration but not too bad. If you don't have wheel hop issues, then I guess you may not need the bars. I have James Duffs and like them. They are simple, effective and inexpensive. If you do order, be sure to tell them that you have the larger 3.25" axle tubes unique to the Level II. Last time I checked, the price was around $100 for the pair. will i have the same issues with mine? i plan on switching from stock 235/75r15 to either 31" or 33". cranking the torsion bar isn't a big deal for me. Same suspension, should be fine. Your bars would sag quicker though unless yours is an FX4 as well, due to the FX4s having stronger t-bars from the factory, IIRC. by sag do you mean bend? i have sport. All t-bars will sag eventually. The FX4 does have a higher grade bar. When they sag, your front end drops a bit, and not even cranking them will be able to lift them back up - they will need to be replaced. Cranking the bars over stock spec will shorten their life span a bit.